Customers want a rich set of ways to target users, based on the users’ behavior and segmentation. They’d like analytics about whether you’re opening the push notification and how you’re interacting with it. They’d like to A / B test, or test variations of the message before they send it, to see which one performs better, and they’d like to send it not just to the mobile app, but they’d like to send it to other devices and channels. We see a lot of past behavior targeting and current behavior targeting based on profiles and on activity and engagement. 50% opt in for push notifications. I’m deeming this year the year of the push notification solely because of the disaster that was Hawaii’s accidental ballistic missile alert. On this week’s Why’d You Push That Button, Kaitlyn Tiffany and I look into why people turn push notifications on, especially for news. Are they masochists? What makes us turn them off? I don’t hate push notifications, so much as I wish they were more targeted and accurate. Kaitlyn resolutely hates them, and that’s fine. This episode packs a lot of content and interviews into 40 minutes, so settle in with enough water and snacks to make it through. We first talk to two women and friends who were in Hawaii when that terrible push was sent — Emily and Meghan. Then we talk to New York Times writer John Herrman about his feelings on pushes, as well as his essay on red dots. 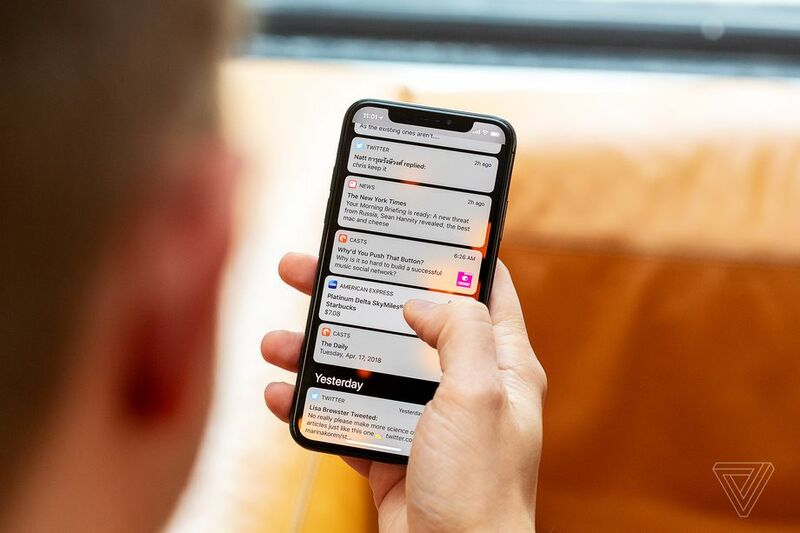 Once we get out all our thoughts, we take it to two experts: Eric Bishop, who also works at The New York Times and strategizes its push strategy, and Christopher Dean, CEO of the company Swrve, which specializes in push notification technology. He explains how push technology might get more sophisticated in the near future. You can read the transcript with Dean below and listen to the full episode above. You can listen to the episode here or anywhere else you find podcasts, like Apple Podcasts, Spotify, Google Play Music, and our RSS feed. Enjoy! Ashley: So, maybe to start you could just introduce yourself and tell us a little bit about your company and what you do. Christopher Dean: Perfect. So, I’m Christopher Dean, and I am the CEO of Swrve, and Swrve is about six years old, and we describe it as a multichannel customer interaction platform. And we actually started off in the mobile game space about six years ago, optimizing mobile gameplay. How do you make sure a user gets onboarded, and registered, and how do you make sure that they stay engaged and keep on playing the game? And we did a bunch of analytics with that, and we built a messaging platform as part of that, and that included in-app messages, like interstitial messages that would appear when you’re in the application, and we built a push notification platform when we did that. And then, we expanded beyond games into media apps, and financial services, and travel, and commerce, and mobile operator apps, and positioned ourselves as a mobile marketing automation platform. Ashley: Awesome. So, this is kind of maybe a really dumb question, but I guess before I started doing this episode, I was like, “Oh, Apple... Like, I could send a push notification if I looked into it,” but it sounds like I have to hire an outside company. If I was an app developer, I’d have to work with an outside company to be able to do pushes. Is that right? No. You could actually write some software, and if you had an application, you could send a push notification to that application that you owned. What happens, though, is Emirates Airlines, for example, which is one of our customers, wants a rich set of ways to target their users, based on the users’ behavior and segmentation. They’d like analytics about whether you’re opening the push notification and how you’re interacting with it. They’d like to A / B test, or test variations of the message before they send it, to see which one performs better, and they’d like to send it not just to the mobile app, but they’d like to send it to those other devices and channels that I sent. So that’s the value add that Swrve adds on top. So, if you just want to send a basic notification, the same notification to many users, it’s actually very easy to do. It’s a broadcast push, but it’s not personalized, and that’s very spammy. But if you want to send a push notification that is highly personalized and highly targeted and sent at the right time, the optimal time when you’re most likely to interact with it, and have it be very rich, and have video in it, and have you be able to press a button, then you’d need to go hire a service or buy a service like Swrve, and that’s the core value, those higher-level value add pieces that we add and provide to our customers, like Emirates Airlines. Kaitlyn: So what kind of audience targeting do you see, for example like media companies, asking for the most? Have you noticed any trends in the last year or two? Yeah. We’ve got to ask another question before we ask that question, though, which is kind of like what kind of jobs do we try to do for a media company? So, some of the big jobs that we do and help them with is... when you and I download the New York Times app, how does The New York Times make sure that you and I are activated and onboarded and then how do we know where the features are, like the features of the New York Times app, and like oh boy, that navigation bar on the left-hand side, if you expand it, that’s where all the sections are, right? A lot of people get lost in these apps, so that’s a core part of what we do is we help you just explore the features. And then how do you get all the permissions? We help The New York Times ask you for the right to send you push notifications, or have access to your location, or use your camera, or share to your contacts. So there’s a bunch of permissions. So, there’s the first part is how do you onboard users and make sure they know how to use the app. Once they’ve done that, how do you then nurture the relationship with you and media and the user? By sending personalized notifications to us, so we keep on interacting with the app. And then, ultimately... and The New York Times monetizes their app by showing some ads and by subscriptions. Now, how do you target users based on each of those different jobs? So, we see media companies wanting to target users and remind them to come back into the app, so you can target them based on their usage, that they were actively using it three times in the last 10 days, and then they stopped using the application. We can create a segment or a behavioral target based on that, when you stop using it for three days, then we can send you a message which gives you an update on the news, for example. We see a lot of media companies wanting to build profiles based on what you’re interested in. You guys may be interested in technology and sports, and that, they would then want to send you news that emphasizes those behaviors, or those profiles. So we see a lot of past behavior targeting and current behavior targeting based on profiles and based on activity and engagement. Those tend to be a lot of the ways companies want to target. We also have the ability to target based on location and geofencing, so if you have just arrived in New York, and you break the geofence that The New York Times has around New York, that could then trigger a message. So we see a lot of location targeting as well. Kaitlyn: So, for this episode, we’re curious about, from the user side, why someone would subscribe to push notifications. It sounds to me like a lot of the behavioral data, like prediction you’re talking about... For a media company, is the main battle just getting people to subscribe and not annoying them to the point where they unsubscribe? Is that a higher-order metric than click-through rate, or am I understanding this incorrectly? I think that that’s pretty spot-on. The most important thing, first and foremost, is to again, make sure that user gets onboarded into the app, and make sure that they have a profile, and we can send them information that the user cares about. And people opt in and want to receive push notifications for a number of reasons, but the best... Basically, industry statistics have about 50 percent of the people opting in, so if you just open up The New York Times app for the first time, and you see that little system notification that says, “Can we send you push notifications?” 50 percent of the users say yes, which means you’ve just eliminated the other 50 percent of your audience. You can’t reach out to them, and to engage them, and try to bring them back into the app. If you run that process in a different way, and as part of the onboarding, you insert a message that says, “Look, we would like to send you push notifications based on your profile and your interests in your specific news areas, and we will send you a customized notification once a day, or when there’s breaking news, you can ...” and you tell the user why they should opt in before you ask them to do it, you’ll increase opt-in rates by 20–30 percent, and you’ll move it from 50 into the 70–80 percent opt-in range. But, take ESPN as a second example. ESPN is very successful in sending personalized score updates out, so I want to follow the scores for the New York Giants, sorry for the San Francisco Giants and the Golden State Warriors. And that’s mostly about broadcasting information. It’s like, you know, giving me, “The Giants are leading the Dodgers three to one,” and it just broadcasts that information. I don’t actually go back into the application in that instance. It’s just pushing information that I’m interested in to me, outside the application. So some of them are to hook you, and bring you back into the app, and read the article. Some of the pushes are actually just to update you on information like a score. Ashley: Oh, cool. So, with the people we talked to who were in Hawaii during the missile notification, I think part of... Like, what made that situation interesting to me, at least, was the fact that we sort of... People think a lot about push notifications, and then to get one that is just blatantly false, at least to me, really kind of upsets the entire system that we’re working with. And I wonder if for you, when you heard that story, if you were like, “Whoa, this like really disrupts our business, and is going to make people turn off push notifications more,” or if you were worried at all about the effects of that event. Yeah, absolutely. So, in Swrve’s system, you have user administration and rights, and different people have different rights, and there’s a workflow, so before someone could send a broadcast notification to everybody in Hawaii saying there’s a missile attack, there’s a review step in Swrve, and that would not have happened. Particularly when it comes to public notifications like that, there need to be processes, and there needs to be administrators, and that is what failed in that instance, and that is what broke down. And, that caused panic and a consternation, so that was very, very concerning. The flip side of that is I think it also proves if there had been a real threat, we do see those notifications being used very effectively, for flood warnings and a variety of other things, and that is the core way to reach the most users out there today with the right device, this new modern device that we have in our hands constantly. So I think it’s very powerful. We just have to be careful with it, and use it properly, and the organizations that send those notifications have to have the right workflow and the right administrative process associated with it in order to use it safely. Ashley: Yeah. It seems like it is a very powerful tool. It does get our attention. I will say I was talking to Kaitlyn before this, and I think a lot of people complain about HQ. You’ve seen HQ, right? Ashley: It’s this trivia game, and it’s on your phone, and they send push notifications every time they do a game, which makes sense, because they need people to get in and participate, but wow, is it annoying. Ashley: It’s probably HQ, yeah. Kaitlyn: We talked about it mostly because it’s like if you look at them... If you don’t see them until later, then it’s like you missed your chance to win a bunch of money. They become like real bummer-town push notifications. Ashley: Well, and for me, I’m just like, “I don’t want to play anymore,” and also, I ignore it once, and then the game always breaks, so then I get another one an hour later that’s like, “We’re back,” and I’m like, “Wow. I already ignored you once. Now I’m getting this again.” Oh my god. I think, well that seems, to me... First of all, one, I think that’s a very bad practice, and it’s very clickbaity. I mean, it’s taking clickbait strategies and applying it to push, and all I think that will ultimately do in the end is annoy you as the user quickly, and you will delete the app. So, you know, you should be able to throttle, and you should be able to control the number of notifications that you want, and provide feedback to an app, saying, “Hey, cut it out,” right? Or, I will just turn the notifications off entirely, right? So, games are very insistent that way, and it’s interesting. Most of the best practices on sending push notifications in the right way have come out of mobile gaming, but there are also a lot of examples, that one being a good one, of them misusing the channel and annoying you. Ashley: Well, now if we’re on the topic of bad push notifications, I want to bring up two things. One is I’ve seen on Instagram a lot that a lot of influencers, so people with a lot of followers, complain about Instagram constantly pushing them to turn on push notifications, and they get so upset, because they’re like, “I do not want to turn these on. I would get too many.” And then in the same vein, I know a lot of people with Tinder get very annoyed, either with A, the thirsty pushes they send that are like, “You have 100 new matches. You should really check the app,” and then two, if they don’t have pushes on, at the top of the app, it always says, “Please turn on push notifications.” And, it just seems like there is a little bit of an annoyance of companies wanting this access. Is it just because once they’ve lost it, they know they’ve lost a crucial way to get into our eyeballs? It is the primary way to drive engagement into an application the moment you’ve downloaded it. I mean, if you think about the whole ad world of Facebook and Instagram on app downloads, that’s the whole media world. People are spending $30+ billion a year advertising and trying to get you to download the app, and what Swrve does, and we think we do well for brands, is the moment you’ve downloaded the app, how do you walk the customer through that journey of onboarding into nurturing through personalized interactions, and then ultimately to get them to use the app. Really it’s monetization, whether you want them to buy something, or date a lot of people on Tinder, or watch a movie, or buy an airplane ticket. So, that’s why those brands are so actively chasing everybody to do it, because you know, if you look at an average game, it loses in the range of 80 percent of all of its users within 90 days, and if you turn push notifications on and you do them in the right way, without annoying users, you can retain 10 or 20 percent more of those users. And, you can use other channels to reengage users. If you stop using the Tinder app, you can... If they have a multichannel system like Swrve, you could trigger an SMS, or you could trigger an email, or you could trigger a browser-based push notification on your desktop. Those are other ways to reengage, but the principal way you want to try to reengage the user is to use push notifications, with relevant content that is intriguing, and is properly targeted, and is personalized. And that’s a best practice, so that’s why they want them on. But I imagine that that can get annoying. So just to be very clear, in iOS, if you said no to the system prompt, the iOS system prompt, if Tinder asks you, “Can we send you push notifications?” and it’s the iOS system prompt, and you’ve said no, Tinder can’t keep asking you. You have to go into your system preferences on the Tinder app, and change it. So, you know, if they’ve asked you in a different way, if they’ve not used the system prompt, and they’ve asked you with an interstitial message that says, “Hey, we want to send you push notifications because you’re going to get more dates,” and you said no, they can keep asking you there. So, some of those guys may actually be off terms of service in what they’re doing. I don’t think it’s [inaudible 00:22:43] I’m sure Tinder’s not. Kaitlyn: I’m glad we talked about Tinder notifications, because I think they’re like the most heinous ones that exist, worse than HQ. They’re really bad. They’re like, “Your profile’s been inactive. You need to log in now and see your swipes,” or whatever. Or like, “Three people swiped right on you. Like, start swiping and you’ll find them in eight hours,” or something. I don’t know. Ashley: They’ll eventually show up. Well, they’re just hooking into your FOMO issues, right? And that’s what they’re trying to do. I mean, the other thing that a lot of apps do as well is they update the badge. You know, the little round circle with the number of messages in it, and they call it badge anxiety. So, they are using human behavior as best they can, to the edge of annoyance, to try to get you to come back into the application, and the more you’re back in that application, the more active you are, they think, and the more engaged you’ll be, and the less likely you will to churn, and the more you will monetize. So that’s the psychology, that’s what they’re attempting to do for sure. It sounds like they have pushed it too far in that instance, and it’s become an annoyance, which means they’ll get people bouncing out of the app and uninstalling based on those requests. Kaitlyn: Well luckily, you’re providing them with the data to figure out that they’re doing that, and then come up with a different way to manipulate us. Highly targeted. No, the whole point of what we’re trying to do is to find the right segment of one, and to send the right message. It’s not to overwhelm people with messages. It’s the exact opposite of that. It’s to send the right message, so that you actually take action. And when done well, that’s the brilliance of all of the behavioral data that comes off of the phone, is that we can give you the right message at the right time, and have it be functional, and have it solve your problem, deliver you utility rather than spamming you with lots and lots of messages. So, if they’re spamming you with lots and lots of messages, then they don’t understand the lessons and the power of the platform today. Yeah. Well, they clearly don’t have the behavioral targeting down, and it is not meaningful, and it’s an annoyance.